TRADE WITH OPPORTUNITIES FOR Professional DEVELOPMENT. •	Experienced and Qualified Teaching Staff. •	Piano Trade supported lectures from Industry specialists. Based at the lovely old Victorian School Buildings now home to Northampton Music & Performing Arts Trust, formerly The Northampton Music School, successful candidates will be able to apply for Student membership of the Piano Tuners Association. •	Piano Tuning by ear and using Electronic Tuning Devices - the integrated method. •	Opportunity for a further 12 months of ongoing professional development. •	Course designed to enable successful graduates to be able to pass Piano Tuners Association Test. •	Course duration is 40 weeks in four blocks of ten weeks over 12 months, with full time tuition for 3 days per week and 2 days personal practice and study. This course is an ideal introduction for anyone who would like to be a professional Piano Tuner or someone who is looking for further practical study. You may already work within the trade and want to develop skills, or be a recent music or other graduate who is self motivated and likes the idea of being independent and working for themselves. Perhaps you fancy a change of career or doing something to complement your existing work Entry to the course is on a person by person basis and places are limited so please do not hesitate to get in touch and have a chat. This course is an ideal introduction for anyone who would like to be a professional Piano Tuner or someone who is looking for further practical study. You may already work within the trade and want to develop skills, or be a recent music or other graduate who is self motivated and likes the idea of being independent and working for themselves. Perhaps you fancy a change of career or doing something to complement your existing work Entry to the course is on a person by person basis and places are limited so please do not hesitate to get in touch and have a chat. 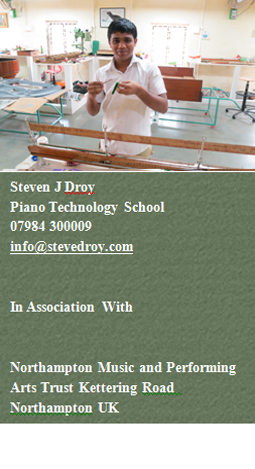 Steve Droy is a concert piano tuner, course principal and programme designer. He is a former lecturer on the Degree course at London Metropolitan University, and until September 2014 was the Director of Furtados Institute of Piano Technology in Mumbai India; where helectured and trained professional piano technicians to work across India. •	He is a full member of the Piano Tuners Association of the and the Institute of Musical Instrument Technicians. •	D J Smallman is a Piano Restorer with over 35 years in the trade. 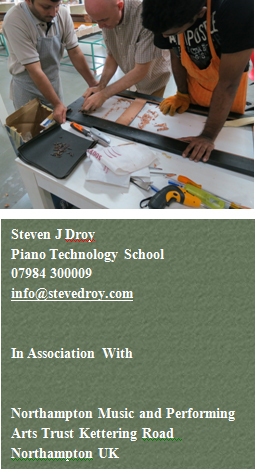 He has worked for world class pianists as Senior Technician for Markson Pianos and Jaques Samuel Pianos of London. He is the former Technical Director of Furtados Institute of Piano Technology and has worked as an independent expert in California & Israel.